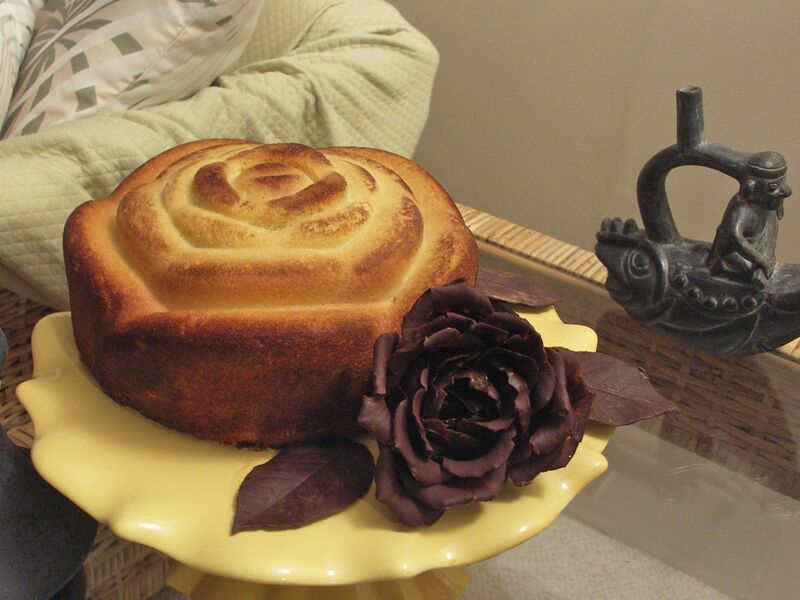 a recent posting from rose’s out-cakes reminded me of of a cake i made back in 2008 that now resembles ROSE’S heavenly CAKES: Genoise Rose (page 169). i made cake bible’s genoise classique using a silicone rose bundt pan. the crust didn’t turn uniformly brown and the baking time was nearly twice. the crust browned more on the tips of the convolutions, which indeed worked out beautifully for a rose shape! also, been a genoise, it didn’t matter to me if the cake turned dry due to the extended baking time: syrup would fix this. in all, the resulting cake had a wonderful texture, airy as usual and deliciously moist after the syrup was applied (and i didn’t need to use more than the usual amount of syrup). it is my suspicion that silicone pans bake cakes moister. however, before you rush and get a silicone bundt pan, be aware that although i was ‘relatively’ successful with my genoise rose, a silicone bundt pan may not work well for a butter or oil based cake which uses baking powder (something to do with the cake not heating or setting fast enough since silicone runs cooler than metal, or the cake not rising tall enough since clinging on silicone is different than clinging on metal). you be your own guinea pig. Hector, thanks for sharing this, it’s so helpful to see an example of what happens with silicone pans! I think Rose says that chocolate butter cakes bake even better in these type of silicone pans, but yellow cakes do not bake well in them. Correct, and perhaps only a 5 or 6 cup silicone pan or a larger one filled only 1/4 deep! Hi Hector!! That’s truly a lovely cake! When you produce a cake like that, the heart element towards the craft shows! Saw a similar cake in Roses’ blog where her student made a cake like this, I think it was done in fresh cream and it had these rose hues in between..was spectacular. Me rushing off to check last 2 weeks posts, there’s quite a bit of back log, smile. And hei, is that rose next to the cake done in chocolate??? absolutely, these are castings of real rose petals done with dark chocolate. 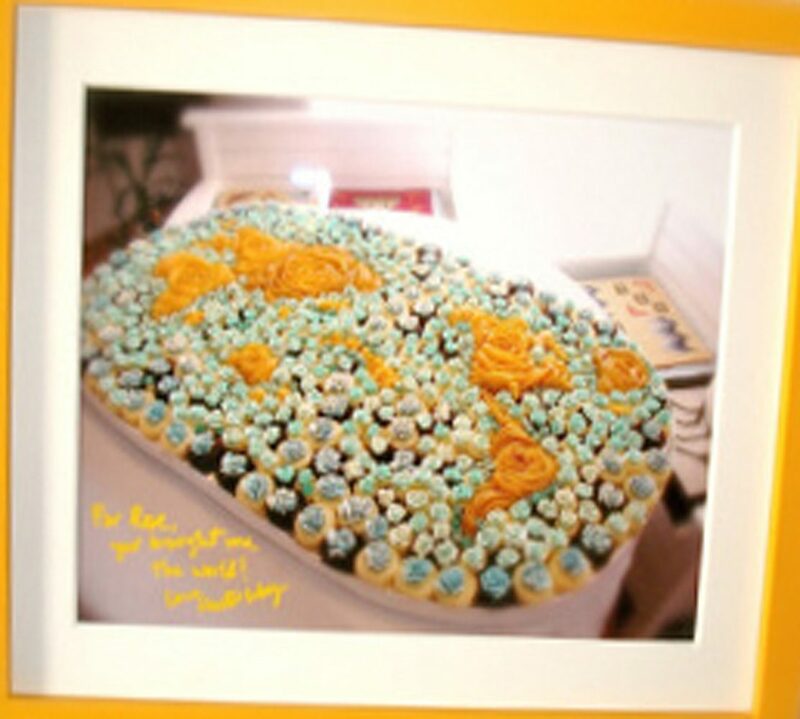 Thats wow..it completes and complements the cake. I tried chocolate leaves going by the cake Bible, but maan, it was a tedious, messy,sorry affair…is that not a lot of work? My leaves broke of in between inspite of double dabs of melted chocolate…guess I thinned it down too much with butter. I realise you need a delicate hand and a lot of patience to do this sort of thing…and how do you fix all the petals together? Apply ganache and then refrigerate? i ‘never’ think the chocolate down with any butter, when doing leaf imprints or petals per say. just use a good 55 to 65% dark chocolate and don’t over melt it will have a hard time becoming solid again (they call this loosing its temper). i melt my chocolate half way only, and let the residual heat melt the rest, the idea is that your finish temperature should be no warmer than 80 degrees. yes, and i do make 2 or 3 passes of chocolate, specially on the center or base of the leaves or petals for added strength. one secret is to avoid the edges at all costs, because if the chocolate has dripped over the edges, it will never peel off in one piece! for the rose petals, i froze the chocolate’d petals for 10 minutes before peeling the petal off. it makes the thin chocolate a lot stronger than just room temp or fridge temp. yes, you fix all the petals together, with more chocolate (not ganache). you also make 3 times the amount of actual petals you will need, as many break off. i kept this rose for 3 cakes i displayed, and the last one was a chocolate oblivion i made for myself for my birthday actual date last year. i don’t think something like this would sell, so it went to me! so happy. Think something like this will sell on Valentine’s Day! yep, follow cake bible instructions.